CARMEL, Calif. – Aug. 8, 2017 – Richard Pietruska will honor Ford’s triumphant return to LeMans with a new sculpture featuring the Ford GT during the Automotive Fine Arts Society (AFAS) exhibit at the Pebble Beach Concours d’Elegance on Aug. 20, 2017, from 9:00 a.m. to 4:30 p.m., in Carmel, California. “Ford GT – The Road to Perfection” brilliantly captures the essence of high speed endurance racing embodied in the sleek new design of the American supercar. “Ford GT – The Road to Perfection” is a 72-inch tall fiberglass and aluminum sculpture that captures the new Ford GT ferociously accelerating up and around a monolithic black base. The Ford GT is finished in Mark IV red that gradually fades to Midnight Blue Metallic as it winds its way up the base. Its white accents complete the piece and pays respect to the red, white and blue racing livery that the Ford GT wore during the 2016 24 Hours of Le Mans. Pietruska will also exhibit a modified version of this original sculpture featuring an aluminum base and different colors. 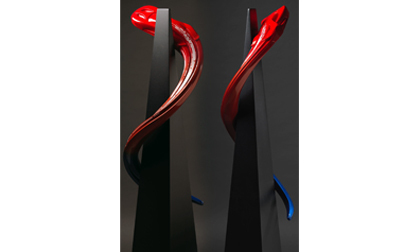 Another piece that will be a part of Pietruska’s AFAS exhibit is “Cobra – The Legend”, a 35-inch wide sculpture featuring the world-famous Shelby Cobra at speed wearing LeMans blue with white racing stripes. “Ferrari Legend”, is an 84-inch tall fiberglass, aluminum and stainless steel sculpture that showcases a Ferrari 330 P4 that is set against five curved, steel tubes that extend above the car in varying lengths. Another sculpture, “Mercedes Benz SK” is a 24-inch wide piece that beautifully captures the elegance and sophistication of a pre-war Mercedes-Benz. Finished in a rich black with polished chrome accents, it sits on top of a handsome art-deco base that captures the character and style of that period. An award-winning artist and designer, Pietruska has worked with a variety of mediums including paintings and tapestries and for the last 18 years he has focused on sculpting. Pietruska has earned national accolades for his work including the prestigious Peter Helck Award for three years consecutively and numerous Athena Awards of Excellence at the Pebble Beach Concoursd’Elegance. With more than 40 years of teaching experience, Pietruska is a highly-respected professor in the Transportation Department at the Art Center College of Design in Pasadena, California. Today, many of his former students are now leading automotive designers in the U.S., Europe and Asia. To learn more about Richard Pietruska and his work, visit www.rpmart.com. AFAS was established in 1983 by a group of artists who are acknowledged by critics to be among the best in their field. Members work in many diverse mediums including oil, watercolors, acrylics, wood, gouache, pen & ink, clay and metal. AFAS and its members participate in select shows across the country including the Pebble Beach Concoursd´Elegance, Dana Point Concoursd’Elegance and the Amelia Island Concoursd´Elegance. Information about AFAS is available at www.autoartgallery.com.